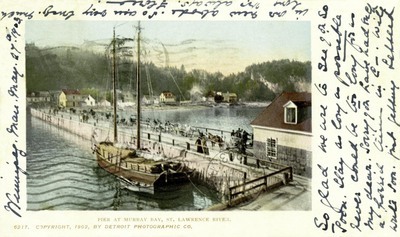 "La Malbaie – Pier at Murray Bay, St. Joseph River"
One color postcard with an undivided back. The postcard was published by Setroit Photographic Company in Detroit, Michigan. Winnipeg. Man. May 27th 1903. / So glad we are to see you so soon. Stay as long as possible never can it be too long for us my dear. Sorry you have had such a horrid time in C-. Will write soon, first getting settled in our new abode. So am very [illegible]. Much love for always. Florie.